It is just that time of the year when I'm looking back on previous 2016 year in my blogger's career. In today's article I will reveal some data behind the blog scenes - both traffic and income for the whole year of 2016. This blog now is more than three years old, and for the last three years it has gone a long way, I have developed my writer skills from so so to average, there is still a long way to make them good and polish to perfect. The good news - I have enjoyed blogging process a lot, it have helped me to make new connections, make new friendships and grow me as a personality. If you have been following my blog for a while, you have already probably noticed that I publish quarterly reports (In fact for the years of 2014 and 2015 I made monthly income reports, but I decided to go with quarter reports since, as I think they illustrates better overall scene about blog growth) Make sure you check them out: Online Income reports. This article is a round up posts for previous four quarterly reports. Blog has gone a long way in 2016 and has increased it's monthly visitor count from about 45,000 in January to more than 70,000 users in December. Both sessions and unique users are up by more than 70%, page views are up by more than 77%, but pages per session have decreased by -3.74% from 1.30 in 2015 to 1.25 in 2015. This is the position makes me worried the most - low pages per session ration isn't good, and I really need to figure out how to increase pages per session in 2017. On the other hand Bounce rate ration is down by -4.31% from 67.95% in 2015 to 65.02% in 2016. Average session duration has been the same both in 2015 and 2016: 01.30 minutes. In total I have written 469 articles in 2016, on average that is 1.28 article per day. Back in 2015 I have written 479 articles and Back in 2014 I have written in total 428 articles. More or less I have pretty stable schedule. Top 10 articles (according to Google Analytics) generated 50.93% from total page views on blog. Ten articles generated more than half of the page views. 5 articles in this top have been written back in 2015, 2 articles are from 2014 and 3 articles are from 2016. Pretty similar scene I observed last year, when most of the content was from previous years. I believe it's normal, of course I would love to see more fresh content being the most viewed, but on the other hand having a massive archive really helps on getting more traffic. Nope, desktop still dominated in 2016. As you can see from image above - Desktop users still accounts for most of the visits at this blog making in total 57.43%, followed by mobile devices (36.59%) and tablets (5.97%). One thing I have noticed here - bounce rates from mobile and tablets are lower than from desktop, and pretty significant lower, the same applies for average time spent on blog. According to the Google Analytics primary audience for this blog are males (68.7%) in age between 25-34 (37.35% from total sessions). I'm a male and I fell into this age category as well, so probably it's not a surprise seeing we have some common interests? The next biggest audience are persons in age group 18-24, making 24.05% from total session, followed by age group 35-44 with 18.44% from total sessions. Persons in age group 18-44 makes about 79.84% from all sessions. So if you are wondering who is actually reading blogs, now you have some basic idea. There are no huge changes in TOP 5, with except that India have switched places with United Kingdom, climbing to the second place. And Georgia have switched ranks with Canada. Georgia (country I have been living for the past 5+ years now ranks 4th, that is not a surprise for me not at all, as I cover many articles on Georgia. See All About Georgia. Around 1/5 of blog traffic are coming from the US (21.18%), followed by India (10.02%) and United Kingdom (7.88%). Traffic from the US if compared to previous year of 2015 has decreased from about 22.73%, while UK has decreased from 10.22% and India increased from 7.80%. United Arab Emirates (2.63%), Philippines (2.25%) and Indonesia (1.77%) are newcomers to top. Germany (2.05%) and Australia (1.72%) also have made to the top 10 in 2016. I wouldn't say I have developed some good social media strategy I was looking to do back at the 2015. Social media actually is tough to compete in - I have been spending on Facebook ads but don't consider them important right now. Combined income streams from affiliate marketing and display ads in 2016 made $18,586,41, which is almost double I made with blog in 2015. Combined RPM from all revenue channels stands at $20.50 for in 2016. Throughout the year RMP values have varied from about $13 at the start of year to $26.05 at the last quarter in 2016. Actually after having average RPM for about $20 makes me feel very good, as I think it's a good value. I wonder will I manage to increase RPM in 2017? As speaking for the previous year (2015) RPM was at $19.27. A slight increase or decrease can make a lot difference at the final earnings. Now this is the tricky part - as I've a simple philosophy regarding to spending, I like to keep it short - to earn some money, you should spend some money. 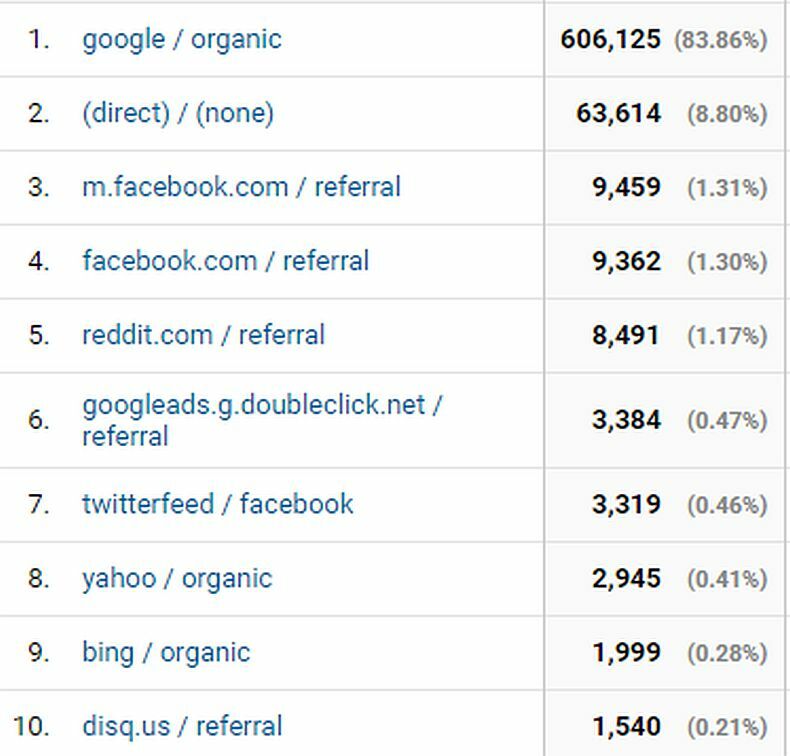 In 2016 I'm looking to reach 650,000 unique visitors, which makes about 54K in month (I think very doable) and $12,000 in income ($1,000 per month) - hard but doable. Now, I've missed about 15,000 users in 2016 from my initial goal, though I would love to count in this goal as achieved. Speaking of financial goals I set for 2016, I have completed and even exceeded it for more than $6,000. Excellent. Speaking about goals for 2017: I'm looking to cross 1 million user milestone, which makes about 83,3K users monthly. My financial goal is more humble - $22,000 income.